UPDATE – THIS PRODUCT HAS PROVEN TO BE DEFECTIVE TO BOTH MYSELF AND A NUMBER OF OTHERS – SPECIALLY “FLYAWAYS” WHEN IT JUST BOLTS INTO THE SKY UNCONTROLLED. I HAVE HAD THIS HAPPEN 4 TIMES AND SO AM RETURNING MY ROLLING SPIDER TO THE PLACE OF PURCHASE. OTHERS HAVE EXPERIENCED THE SAME OR WORSE. THE REVIEW IS STILL POSTED SO YOU CAN BECOME FAMILIAR WITH WHAT THIS DRONE MIGHT BE…IF AND WHEN THEY FIX IT. Novices, Beginners, Technology demonstrations, etc. – Great for small spaces and yards, indoor and out. The Parrot Rolling Spider is a small quadcopter…quite a bit bigger than most nano-sized units and even slightly bigger than the popular micros like the Hubsan X4. It is vastly different that most “toy grade” micros in that it contains more sophisticated sensors and programming. Stability is achieved with the combination of data – as Parrot describes it “Provided by data fusion of an ultrasonic sensor, a 3-axis gyroscope and 3-axis accelerometer, a vertical camera and a pressure sensor”. 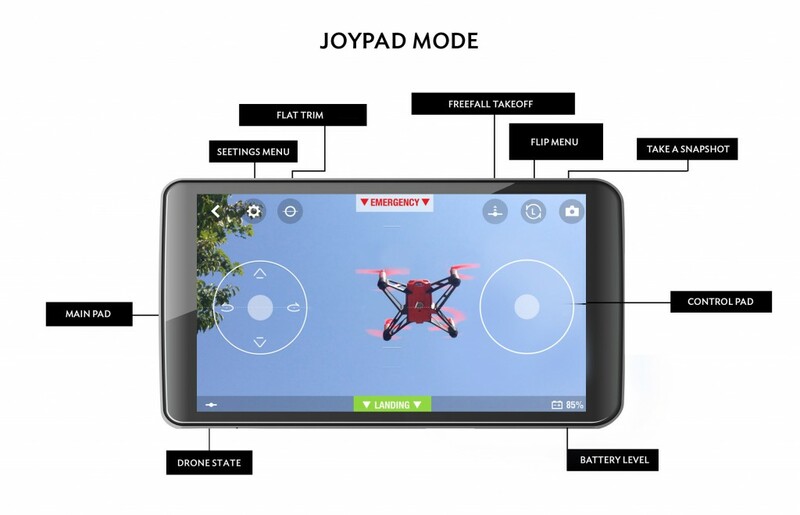 Most smaller quadcopters only have the 6-axis gyro’s and accelerometers, meaning this is a much “smarter” machine. The ultrasonic sensor is sonar which is bounced off the ground – the pressure sensor is a barometer, which knows comparisons of height. The vertical camera is used to determine position based imaging changes. It also can take low resolution photos straight down. While greatly limited in terms of precision control, distance flown, etc. the Rolling Spider still presents an interesting quadcopter for many. It’s probably the first machine I would buy for my parents (80+ years old) or others who are never likely to become familiar with larger and more complicated machines. I think the best description of this quadcopter is “toy gadget” since it serves absolutely no function other than fun and demonstration. Not much! You get the Rolling Spider, a USB cord for connecting it (this charges the battery) and one removable battery along with the wheels. The quad can be used with or without the wheels – although the wheels are suggested for indoor flight and for protecting others you may be flying near. A spare set of props is not provided. As of this writing, spare batteries are about $20 and props about $6. The lack of a separate battery charges is a big minus. I’m sure Parrot or others will release them soon so that Spider owners can charge more than one battery at a time. The Rolling Spider comes fully assembled except for the wheels. You’ll need to install the Parrot Freeflight app on your choice of smartphone or tablet and insert and charge up the included battery using the USB cord and your choice of USB charger (your computer or a USB wall plug). The battery takes 90 minutes for a full charge, so don’t expect much fun in between your wait times! Be sure the Rolling Spider is placed on a flat surface, then press the ‘Flat Trim’ button once. To start flying, press the ‘Take-off’ button. The quad will rise approx 3 feet into the air and stabilize. It will remains stable in the air without touching any controls. To raise the Rolling Spider, slide your thumb up on the joystick located on the left side of the screen. To rotate the Rolling Spider, slide your left thumb to the right or to the left. To move the Parrot Rolling Spider, just maintain your right thumb on the joystick and tilt the tablet/smartphone: forward, backward, left and right. (In ace mode and Joypad mode, maintain your left thumb instead). We will write more on the flying experience if and when Parrot fixes this machines so that it works out of the box. As of now, it has problems which will make most buyers lose their drone (flyaways!) when used outside. This is a well thought out and well built machine. However, most experienced “hobby” pilots are not going to want this quad. It’s more of an exercise in miniaturization as well as a technology demo and “fun gadget”. On the other hand if you have been reading about drones and wanted to get some idea of how they work, this could be a good starting place. Also, those of us – such as myself – who use quadcopters for demonstration and education will likely find this is a good candidate for bringing along and safely introducing others to the hobby. It also makes a great gift to “the person who has everything”. I suppose truckloads of them will be sold during the holiday season this year and be climbing the walls of the world before New Year’s Day! 1. Top notch engineering and design – the body, arms, etc. are far and away better than similar toy models. 2. Built-in sensors – it uses a combo of 6-axis, barometer, sonar and pictures to keep it’s stability. Again, you won’t find that in any other quads down in the gadget price range. 4. The wheels – this is pretty cool stuff for using inside and climbing walls. This is probably the first quad wifey will allow me to use in the house (other than the basement). 5. Lots of options and settings within the FreeFlight program. 6. Built using Linux – computer geeks will likely be able to further program this in the future. 4. No separate battery charger (yet). The Parrot Rolling Spider is available through Amazon, The Apple Store and many other online and bricks-and-mortar retailers.